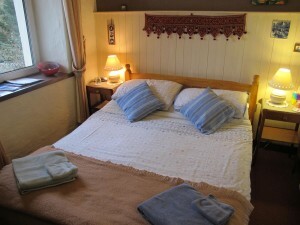 Tŷ Mawr has three double rooms (they are all located on the first floor). 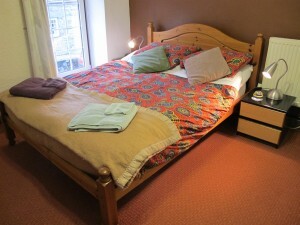 All rooms have free internet access, freeview television, central heating, hairdryer, radio/alarm clock and a hospitality tray with tea, coffee and home made cakes or biscuits. Our rooms are not suitable for young children; the minimum age is 8 years. This is the largest of the three rooms. It’s located at the front of the B&B and has its own toilet and shower. It has also a ceiling fan and small fridge. The double bed is 6’4″ long and 4’6″ wide. 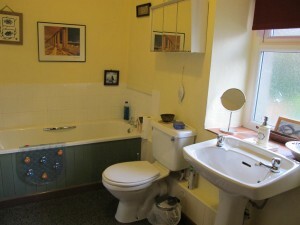 These two rooms are located at the back of the B&B and they share a bathroom with toilet, shower and a separate bathtub. Room 2 is a small room with a double bed (6’4″ long and 4’6″ wide). 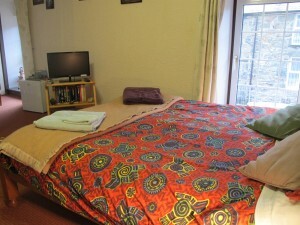 It is a double room, but can also be used for single occupancy. Room 3 is larger than room 2 and also has a double bed measuring 6’4″ long and 4’6″ wide. This Bathroom is shared by rooms 2 & 3.